Season five of The Americans planted the seed of Elizabeth and Phillip returning home and it will be interesting to see if the writers end the show that way or if they will kill off either of these characters. When one thinks of compelling television, one undoubtedly thinks of FX's The Americans. With the recent start of the sixth and final season, we are once again drawn into the dramatic world of international espionage disguised as normal suburban family life… Or is it the other way around? 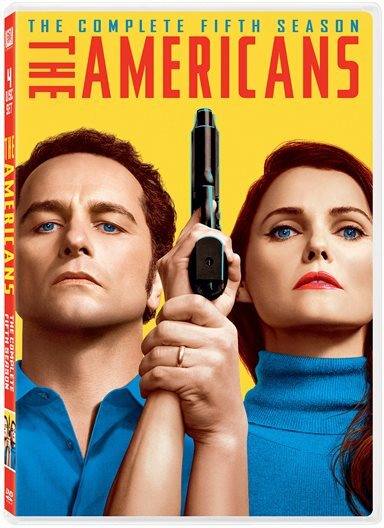 As we brokenheartedly await the ending of a terrific show, we can relive and remember what we loved about last season as The Americans, The Complete Fifth Season DVD is in stores now. Why not add it to your collection so you can rewatch episodes to fill your time while anxiously awaiting each new episode of season six every week? Elizabeth (Keri Russell; Dawn of the Planet of the Apes) and Phillip (Matthew Rhys; The Post) Jennings seem like your all American family with 2.4 kids – I'm kidding- with their son Henry (Keidrich Sellati; Rockaway) and their daughter Paige (Holly Taylor; Ashley). They lead your average life with a house and jobs and the usual parent/child, sibling, spouse squabbles. The difference is that Elizabeth and Phillip just happen to be Russian spies and their next-door neighbor, Stan Beeman (Noah Emmerich; The Truman Show), is an FBI agent. As season five opens, we see Paige having issues with the knowledge that her parents are spies. Throughout the season she grapples with this, even as Elizabeth and Phillip attempt to include her- minimally – in their assignments in order to try and waylay her fears. During this season we also see Paige rely heavily on Pastor Tim (Kelly AuCoin; Billions) but by the end of the season he is "removed". Henry, on the other hand, is making new friends including a girl named Chris that he wants to date. As is common with young crushes, he decides he wants to go to the same boarding school she will be attending next year and is encouraged by Phillip when he tells Henry that if he gets into the school he can attend next year. Unfortunately, circumstances change by the end of Season Five and, after Henry is accepted to the school, Phillip informs him he cannot go. Russell and Rhys are magnetic in their roles and Sellati and Taylor round out their family unit well. Of course, they have a supporting cast that are standouts on their own with the best being Emmerich. New edition Dvorovenko fits in nicely with this group and offers some terrific drama of her own. The writing is some of the best around, which makes the show a continual winner. It seems to be a drama about the spy game in the 1980's but really it is much more about family dynamics and relationships. These elements are what make the show so relatable. They are what draw the audience in and keep them coming back for more. The DVD only offers a few extras, which include deleted scenes, a gag reel and a feature called first look. They are interesting enough but only add to the intense drama unfolding with each of the season's thirteen episodes. I'm sure The Americans could continue for several more seasons if it wanted to, which makes it perplexing as to why they are choosing to end it after the latest season. Season five planted the seed of Elizabeth and Phillip returning home and it will be interesting to see if the writers end the show that way or if they will kill off either of these characters. We could speculate all day and probably won't come up with the right answer, so it best to just sit back and watch it play out to the end. In the meantime, grab The Americans, The Complete Fifth Season. You won't regret it. Download The Americans: The Complete Fifth Season from the iTunes Store in Digial HD. For more information about The Americans visit the FlickDirect Movie Database.